We continue to receive several questions about Northern corn leaf blight, Goss's wilt and fungicides. Here is some additional information. Parts of rural Iowa are abuzz about fungicide use to manage some emerging diseases, and we have received several questions about the basics of fungicides. A quick reminder, APS PRESS recently published a book geared towards farmers and agronomists on the basics of fungicides. It is available in print, Kindle version, and online through the Plant Management Network. The Plant Management Network also has several webinars on fungicide use for managing leaf diseases on corn and soybean. Note: membership may be required to access some information on Plant Management Network. 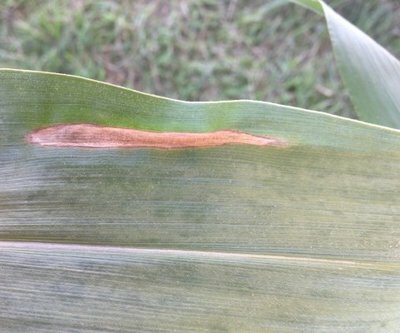 Is there a threshold for Northern corn leaf blight (or other diseases for that matter)? Check susceptibility of hybrid/cultivar in seed company literature. 2. If the above three bullet points indicate a risk of disease, scout at-risk fields. It is important to look in many different places across the entire field since the environment may differ across the field, e.g. river bottom to the crest of a hill. 3. If you find ANY of foliar fungal diseases (e.g., gray leaf spot, northern corn leaf blight, northern corn leaf spot, southern rust on corn; frogeye leaf spot, soybean rust on soybean) in these at risk fields, spray. Make sure to properly identify the disease. You don't want to be spraying a field with Goss's wilt with a fungicide. 4. If you have a "resistant" hybrid and disease is showing up, collect some leaves and send them to the Plant and Insect Diagnostic Clinic (ATTN: Alison Robertson and Daren Mueller). If it is NCLB you should probably consider a fungicide application because it could be a race that defeats the resistance gene in that hybrid. If it is gray leaf spot, a fungicide application is probably NOT necessary on resistant hybrid. Gray leaf spot lesions on resistant hybrids tend to be smaller and develop slower than those on more susceptible hybrids. 5. If there is no disease, consider delaying spraying one week until you scout field again. If no disease occurs by brown silk for corn or middle of pod fill for soybean, chances of a return on your investment (ROI) for a fungicide application are not as good. Research done by several pathologists across the Midwest suggests that ROI is more likely when conditions are favorable for disease. Resistance to strobilurin fungicides has been reported in the fungi that cause frogeye leaf spot, and Cercospora leaf blight in several states. Although no resistance has been reported in Iowa or in corn pathogens across the Midwest, we continue to monitor fields. Daren Mueller is an extension soybean pathologist and assistant professor in the Department of Plant Pathology and Microbiology. He can be reached at dsmuelle@iastate.edu or 515-460-8000. Alison Robertson, Ph.D., is an associate professor/extension field crops pathologist. She can be reached at alisonr@iastate.edu or 515-294-6708. Links to this article are strongly encouraged, and this article may be republished without further permission if published as written and if credit is given to the author, Integrated Crop Management News, and Iowa State University Extension and Outreach. If this article is to be used in any other manner, permission from the author is required. This article was originally published on July 17, 2014. The information contained within may not be the most current and accurate depending on when it is accessed.